Scotch Gambit sidelines - Chess Gambits- Harking back to the 19th century! The Scotch Gambit tends mainly to transpose to the Two Knights Defence after 4...Nf6, or the Giuoco Piano after 4...Bc5 5.c3 Nf6, while avoiding Black's defences that hold onto the strong-point on e5 (1.e4 e5 2.Nf3 Nc6 3.Bc4 Be7 4.d4 d6, and 3...Bc5 4.c3 Qe7). However, Black sometimes opts for sub-optimal lines that allow White more freedom. A fairly common response at club level is 4...h6, preventing a piece from landing on g5. White actually has to be fairly careful against this, as the immediate 5.c3 runs into 5...Nf6 counterattacking against e4 and White can no longer effectively meet this with 6.Ng5. 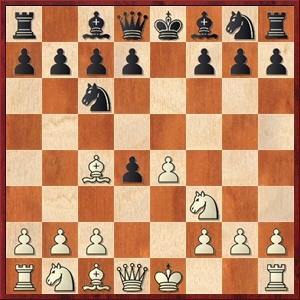 Therefore White chooses between 5.Nxd4, with a slight advantage, or 5.0-0 with 6.c3 to follow, which should give White an improved version of the Göring Gambit in which ...h7-h6 is not particularly useful. A reasonable idea is 4...g6 intending a kingside fianchetto, which has been explored extensively by Michael Goeller in his article A Fianchetto System in the Open Games Part 2 (particularly his Game 6). White should play 5.c3 against this, since I am not convinced that White gets any advantage at all following 5.Nxd4 due to the pressure down the long diagonal after ...Bf8-g7. After 5.c3, 5...d3 is advisable since 5...dxc3 leads into a good line of the Göring Gambit for White, but then White can get an edge with 6.Qxd3 followed by Bg5, 0-0 and Nbd2, restricting Black's pressure down the long diagonal. 4...Be7 and 4...d6 usually lead to Hungarian Defence positions with an early ...e5xd4, following 5.Nxd4 which is sufficient to give White a small advantage. In both cases it is also possible to offer a gambit with 5.c3, although this is less likely to provide White with a theoretical advantage. 4...Be7 5.c3 should be met by 5...Na5 (5...dxc3 is dubious because both 6.Nxc3 and 6.Qd5 are strong for White), whereupon White's best bet is to continue offering a gambit with 6.Bd3, which should provide enough compensation for the pawn. After 4...d6 5.c3, the most critical test is 5...Nf6, whereupon White can try either 6.cxd4 Nxe4 7.Qb3, or 6.Ng5, leading to complex play, while 5...dxc3 transposes into one of the main lines of the Göring Gambit, which should be equal with best play and typically leads to board-wide chaos. 5...Ne5 is also a tricky response but White can get good compensation for the pawn against this with a few accurate moves.